Hi everyone! 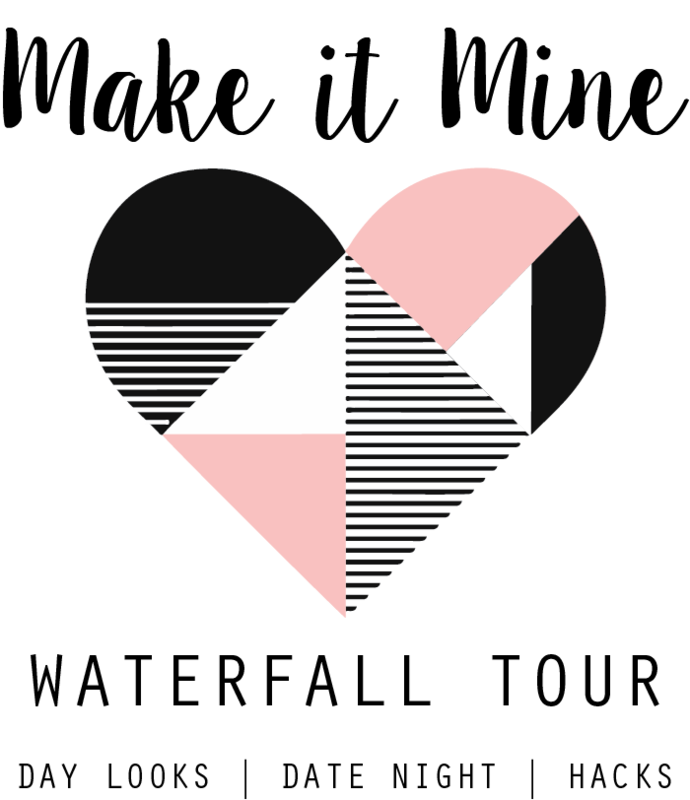 Welcome to Day 1 of the Make It Mine Women's Waterfall Tour! There is a seriously awesome prize to be won for following the tour, so be sure to scroll to the bottom to enter the rafflecopter! There is also a link up with a great fabric & sewing kit prize. All you have to do is sew up a Women's or Girl's Waterfall and link up to THIS post. Who doesn't want free fabric & notions!? Today's Tour Theme is "Day Look". 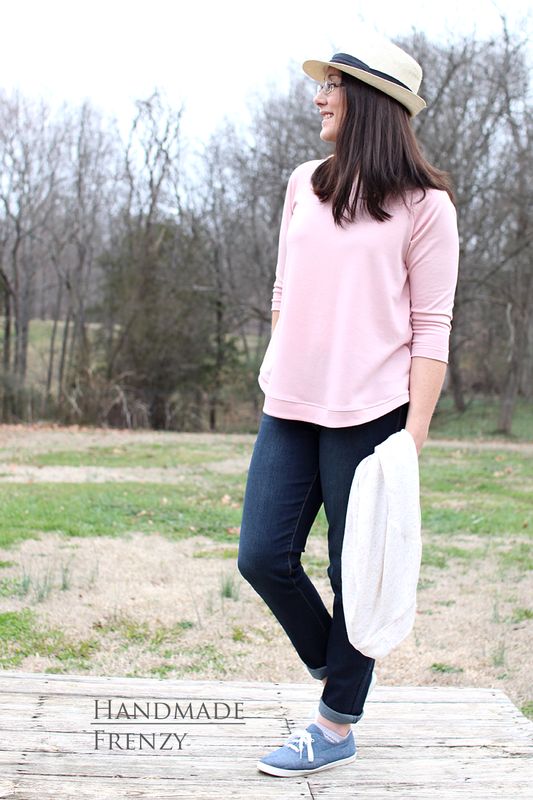 Being a mom to 3 littles, my day looks require loads of comfort and hopefully a little style. 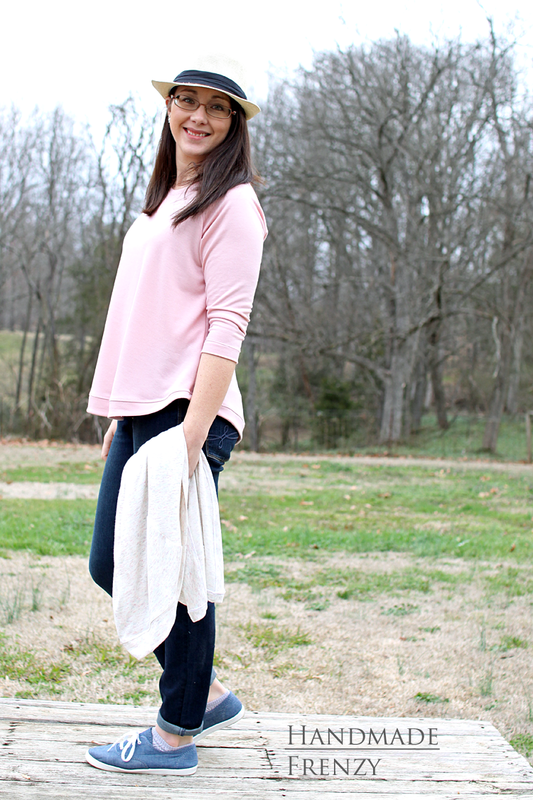 Enter soft, drapey, french terry & lightweight sweater knit. Swoon. Add a fedora, jeans + tennies and I'm ready to head to the zoo, the museum, anywhere really, with my crew. To achieve this somewhat different look to the Women's Waterfall, I ended up with a bit of a pattern hack. But a very simple one! Oh, I also need to note that I sized down one size in the bodice for this version. I kept the sleeves my regular size, because, chubby arms. But for me personally, this fit is fantastic and I'll be repeating this size combo in the future! To start off, I lengthened the bodice by 2 inches. For reference I am 5'3". Then I shortened the ruffle by 6 (yes, six) inches and took out the ruffle part. To do this, I walked the ruffle pattern piece along the bottom edge of the bodice pattern piece to determine how much to take off. Then, using my clear ruler, measured up from the bottom of the ruffle, 6 inches, making marks every so often and then redrawing the curve. 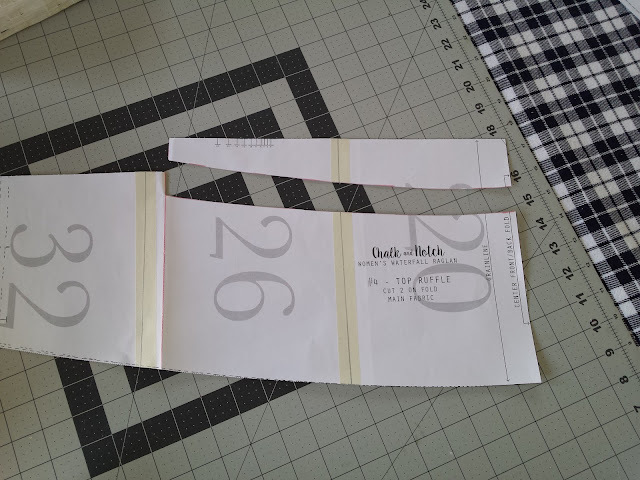 I then cut this out and had my new pattern piece. Next, I cut out 4 (instead of 2 as per pattern) of the new band pieces, sewed the bottom edges together with a 1/4" SA, flipped them right sides out and sewed with raw edges aligned to the bottom of the bodice pieces. Easy peasy! I am seriously, maybe just a little ridiculously, in love with my new top. 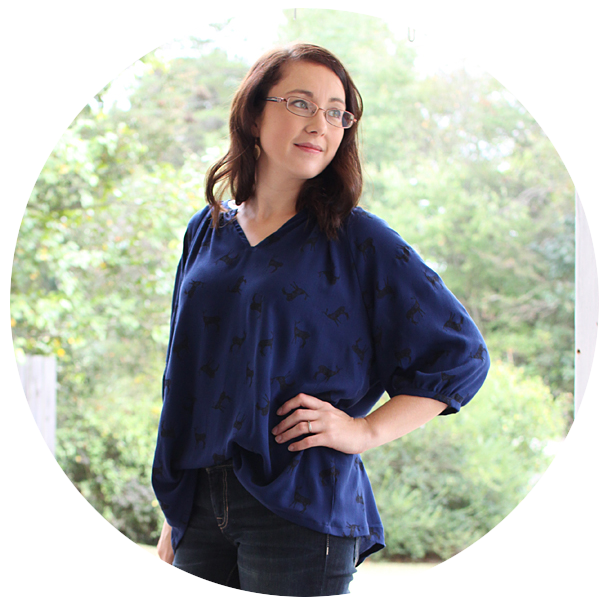 I absolutely love how the hem curves with this top and I love the clean lines it creates without the ruffle. So let's dish about the fabric I used for this. 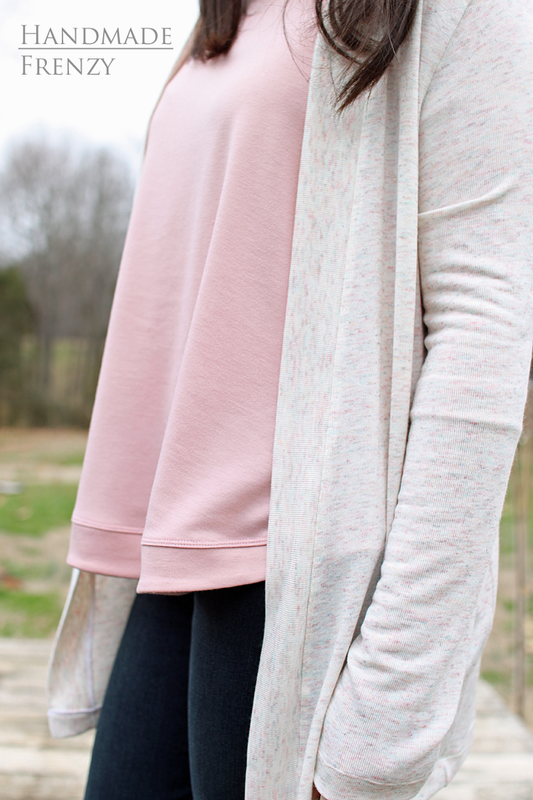 It is a super soft, lightweight french terry from LA Finch Fabrics. The drape and soft feel of this fabric is for real amazing. I know I will be wearing this top so much in the coming months, and I'm considering ordering some more for a spring dress for myself. I'm also planning a matching dress for my daughter with the scraps from this project. That's really how much I love it!! 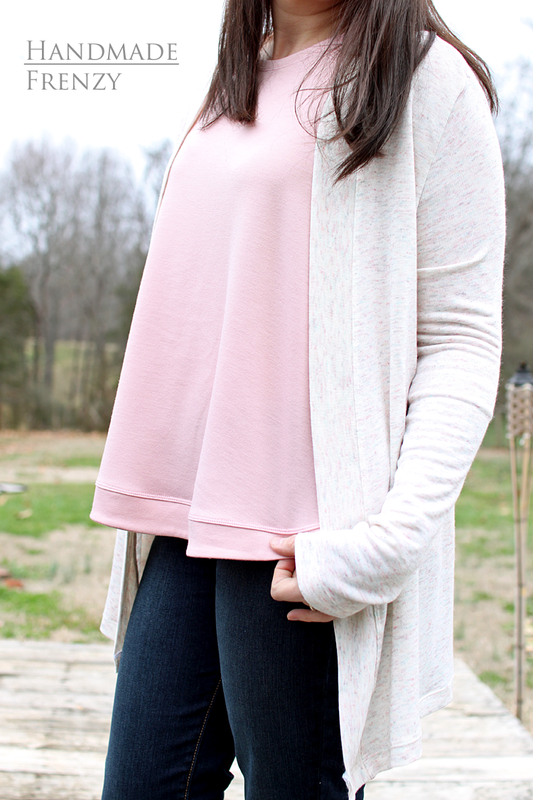 Cardigans are a huge staple in my wardrobe and I love the Waterfall paired with one, so I had to make a new one to specifically coordinate with it! It was serendipitous. 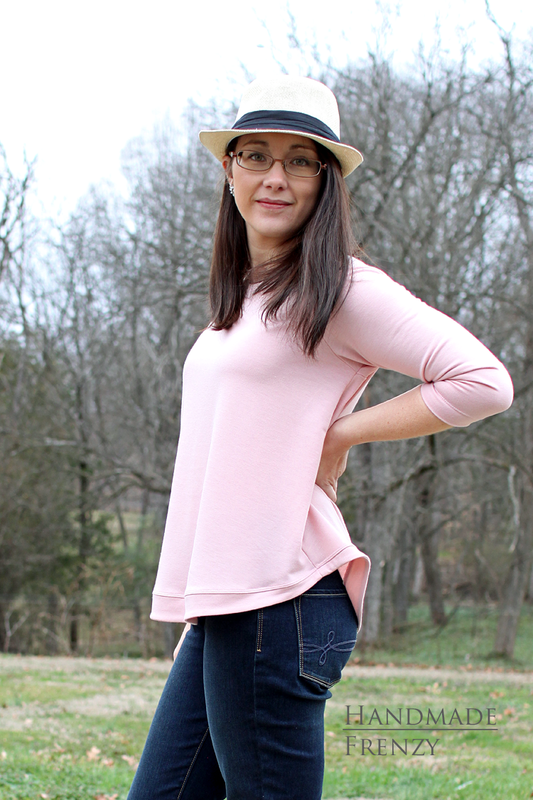 I had these 2 fabrics in my stash, the french terry only a month or two, but the sweater knit for nearly a year, they were definitely meant to be together! Do you see how those pinks match up!? Sorry guys, I haven't been this thrilled with a me-made outfit in a while, I can't help it. Lol! I used the Eleanor Cardigan pattern for this sweater. 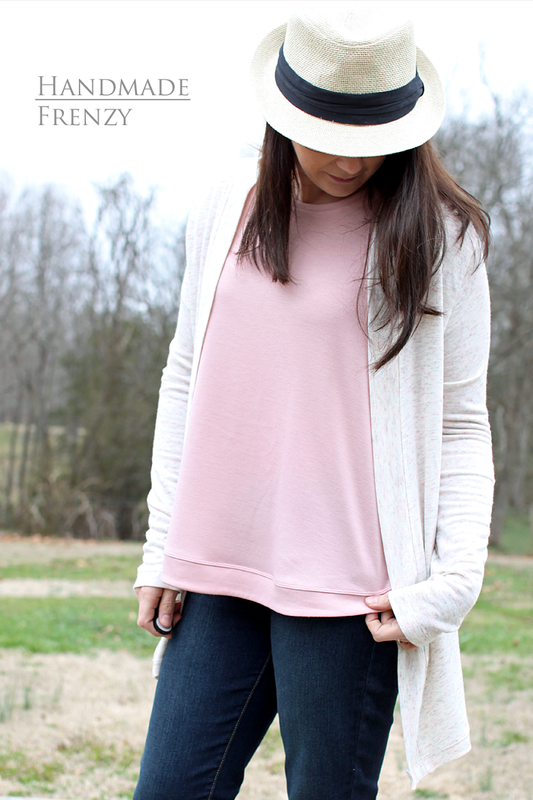 It's a lovely, oversized, simple cardigan with 2 length options. I went with the hip length and took 2 inches off, because, short. The sleeves are still plenty long, I took an inch off and hemmed an inch, but I may go back and chop off some more. I also sized down one size from the size chart because I knew this fabric would "grow" some. I really loved the simplicity of the pattern and how quickly and easily it came together. I'm sure there will be more in my future! Thanks so much for reading! I'll leave you with a few more pics and then don't forget to enter the giveaway at the bottom and link up to this post (HERE) for more prizes! 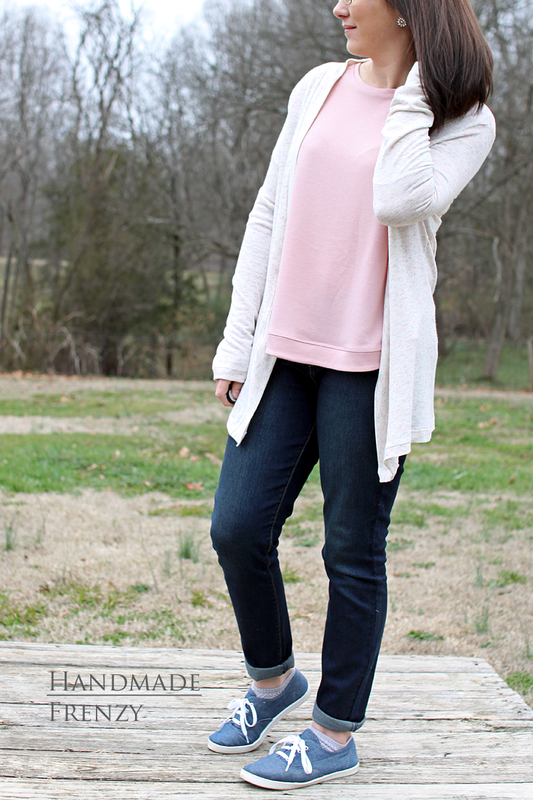 Cardigan: Hip length - shortened 2 inches, sized down one size because of very drapey open weave fabric. Shoes: cheap, but these are on their way as replacements! 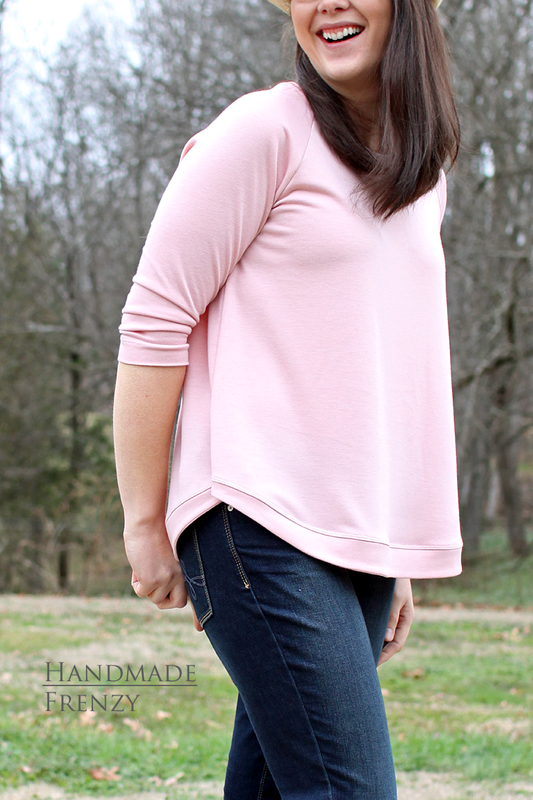 I love love love this top! I can't get over it <3 I will have to try your tutorial when I'm feeling courageous, because I love how it looks. And that color is gorgeous. I think you should make a dress, too!! I love how that hem turned out. so clever! Just too cute!! 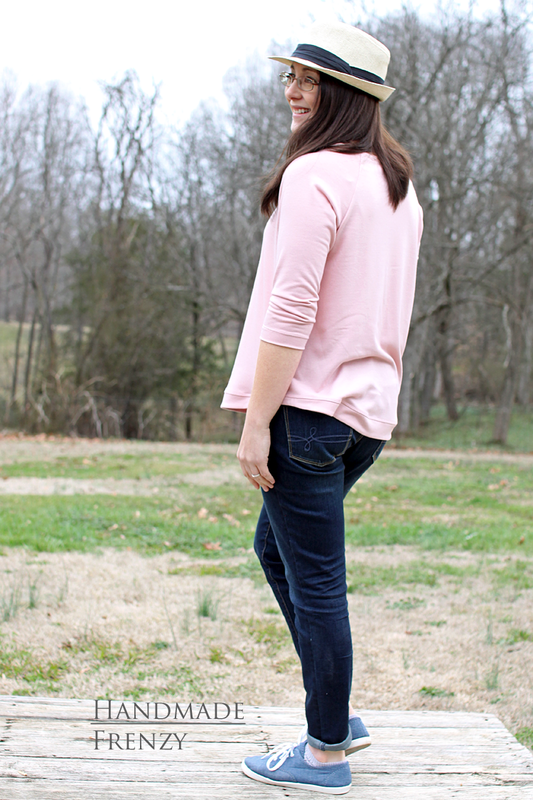 Such a perfect shade of pink, and i love how you styled it! I want this whole outfit! It's the perfect mommin' in style look!